Science fiction is a rapidly growing force in the entertainment world, with major franchises like Star Wars and Star Trek filming new big-budget films, as well as Marvel Studios taking its films to the stars. 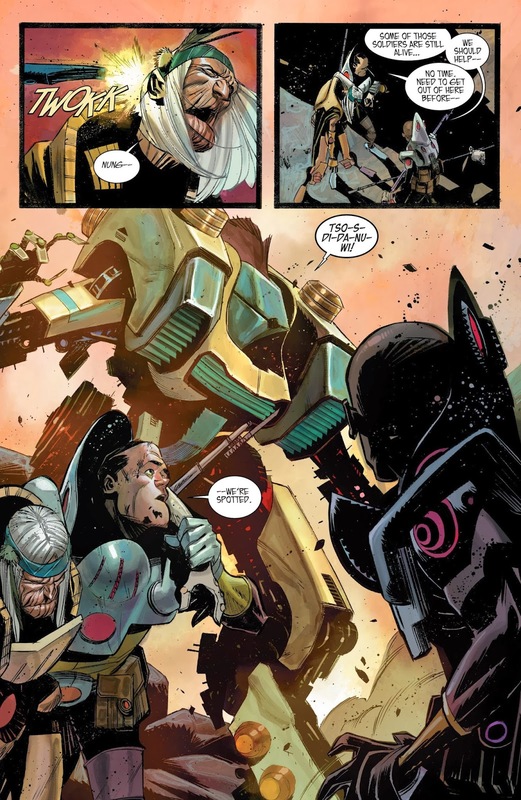 The comic world has been receiving an influx of sensational sci-fi in the past few years, but Rick Remender has managed to make a distinct addition to the new universe of sci-fi content with Black Science. The story thus far has been split into three distinct sections, following two groups of parallel-universe-exploring "dimensionauts" to a world of "inverse manifest destiny," where a German army circa World War I battles a technologically advanced Native American nation. Private security leaders Ward and Shawn, along with Kadir, who funded the Pillar and is now trapped traveling with the rest of them, watch as a medicine man of the superpowered Native American armies heals a soldier from a seemingly fatal wound. They decide that kidnapping him is the only way they can save lead scientist Grant McCay, but the plan fails as quickly as it was formulated due to the arrival of a Native American in a Matrix Revolutions-like mech suit. While the mech tries to take out Ward and Shawn, Kadir sneaks behind the mechanical monster and destroys it with a defeated German soldier's grenade. Back at the Pillar, Chandra, another scientist, holds the team's German captive at gunpoint but rapidly loses control of the situation when the German soldier begins to relentlessly cry out for help. The group decides to hide and tries to muffle the soldier, but to no avail. Another scientist, Beccah, finally realizes that further attention could get them killed and fights through both the soldier's thrashing and her own tears to drown the captive in a puddle of mud. Issue three is bookended with flashbacks. The first depicts Grant being intimate with Beccah just a few hours before the Pillar begins to malfunction, revealing that their affair had been on the verge of going public just before the accident. When we next return to the past at the end of the issue, Grant is guiding his children on a tour of his facility. He explains to his son that parallel worlds all stack on one another like rings of an onion and that no one knows just was is at the center, but with the Pillar they may now jump between dimensions and find out. Before they can speculate any further, Kadir rushes in just as the Pillar goes off, revealing the events surrounding the misfire and the subsequent dilemma of the "dimensionauts." The issue was a fun mix of action and back story. So far, the flashbacks and constant action have left the story without much room to breathe, but the fun of exploring Remender's sci-fi worlds makes it worthwhile. Although we haven't gotten to spend much time getting to know the characters yet, we are getting to explore worlds that just couldn't exist in any other medium. 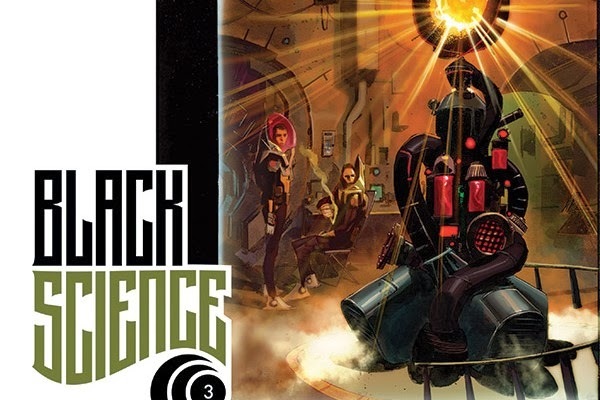 What have you thought of Black Science so far? Do you think it lives up to, or even surpasses Remender's cult classic Fear Agent? Let us know in the comments section below!